This Healing Practices Pack offers a complete yet essential presentation of teachings and practices on healing that is suitable for students of all levels. An audio with advice about how we could direct our practice towards averting and healing from cancer, read by Dan Ewen. The purpose of this pack is to give support and provide inspiration for healing. However this should by no means be seen as a substitute for seeking proper treatment, and advice from qualified medical experts. This pack is available for sale as 2 DVDs, a CD and a booklet. There is also a downloadable version available to Rigpa students as part of the All-Encompassing Path Subscription. Central to the practice of healing in the Vajrayana tradition is Vajrasattva. He is the embodiment of the indestructible energy of enlightenment and the healing powers of all the buddhas, and the purity of our own inherent, enlightened nature. 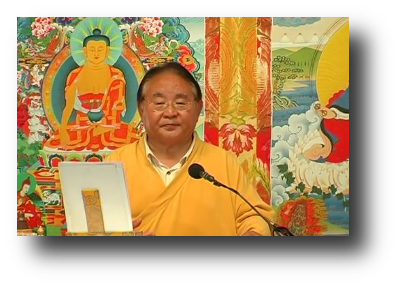 The practice of the Guru Rinpoche of healing has been developed by Sogyal Rinpoche over many years. Focusing on three aspects of Guru Rinpoche, it brings together a number of key aspects of practice, including: healing, long life, protection, meditation and the nature of mind. From the Special Practice of Guru Rinpoche.